Forums • Projects • Want to become part of the site? 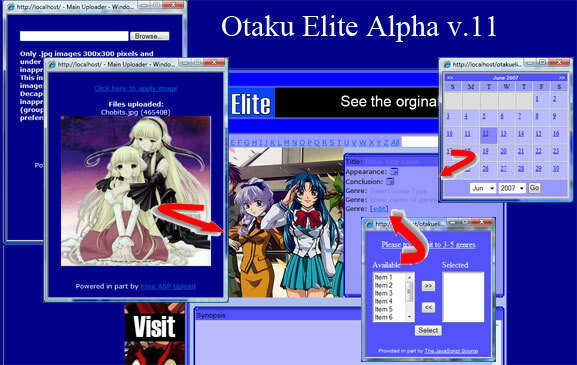 OtakuElite was created back in 2006 as an amateur site when I had absolutely no idea what I was doing. To say the least it wasn't pretty. Don't believe me? Since that time the site slowly grew to what it is today as my skills improved. When I created this site I had the intent of it being designed for users by users. This means not just user generated content but the actual site itself. As users request features I want to add as many of them as reasonably possible. However to do this I need help. This is where you come in. I'm looking for anyone, and I mean anyone, who has the free time and wants to join a team (of just me and Ox King right now!) to help bring this site to the next level. So how can you help? And much more! If you're good enough I'll personally customize the site to meet your needs. Even if you currently have a blog or website and want to work together to promote each other I'll customize the site just for you. The only requirements are you have the time and a passion for anime. And of course you have to keep it within the terms of service! Just post in the forums or email me at JoinIn@otakuelite.com! Not sure on how to help? Just ask! Thanks as always! And I do seriously thank each and everyone of you! I'm surprised no one else no else jumped on this offer well I already sent about 5-7 characters. This may only be my second day but I would like to help. I'm not a great technological whiz but tell what you need done! I will still send in characters and anime to increase the sites variety. Keep up with the entries and I'll look into what I can find for you. So anything I can do yet. What do you want to do? Give me some ideas and I'll see what I can do. Right now you're doing a ton by adding entries. Anything you enjoy doing or are good at? Well I can still make characters but I am running out of ideas for new anime I made a post but to no effect so if you can get people to talk about anime they want, that can make me be more productive. -I slightly good at drawing manga faces. I'll provide an example soon. Also can I help make this website better know I already talked to ~webmaster about it in the forums if you want to see. I also enjoy blogging so far. I'm working on the blog system today. It's pretty simple so far and it's just like the forum editor. I'll be featuring a few blogs once the count gets high enough. If you want you can write a few blogs and I'll look into featuring it. Should hopefully be finished sometime today. And by today I mean late at night. Alright thanks to ~Webmaster I will start Blogging on Anime when I can and of course continue submitting Anime and Characters. Now then to the point I will say I can not always be here on the site as things do come up one thing being school! Other than that I was wondering if you had anything else for which I can do here really, anything. Thank you for listening and this was "The Awsome" speaking. I see hehe I will destroy this site with my antics! Enjoy! I'm going to take a nap now. Only slept 3 hours last night. Why do you need an editorialist?
! Now that I can do that when can I edit Anime? I plan on eventually expanding out more into opinion type news articles. It's generally the same as blogging except the main differences is it's more about current events and requires a lot of documentation of liable sources. For now the blog system offers an option for both, but I do plan to do more with news in the distant future. Granted nowhere near as detailed as ANN. Plus I would need an editor before I even begin to feel comfortable referring it as news. That's really cool and interesting. I'm actually planning on starting a new segment for the blog geared towards general anime. It won't always be news, since, like you mentioned, that requires a lot of documentation and resourcing of info, but the first entry will be. At least, that's what I'm planning if I get the "okay" from my source. I have found an area in which I'm good at. I seem to be good at arguing a point if I know enough on the subject even then I provide a good word on the situation. For reference check "HAREM ANIME: For both GUYS and GIRLS" in which are talked more professional on the subject. That's my only point of reference to support this. The reason I posted this here is to see if this will allow me to help in future endeavors. But as ~Webmaster has said I shall not charge head on into this. Not sure on how debate skills will fit in. lol Just glancing over your review it's not bad. I'm going to read it more in depth later when I don't have bags under my eyes. You're doing a huge help on the forums though by keeping things active which is always a major help. Just sent you an email. Hook me up with a reply when you get a chance.